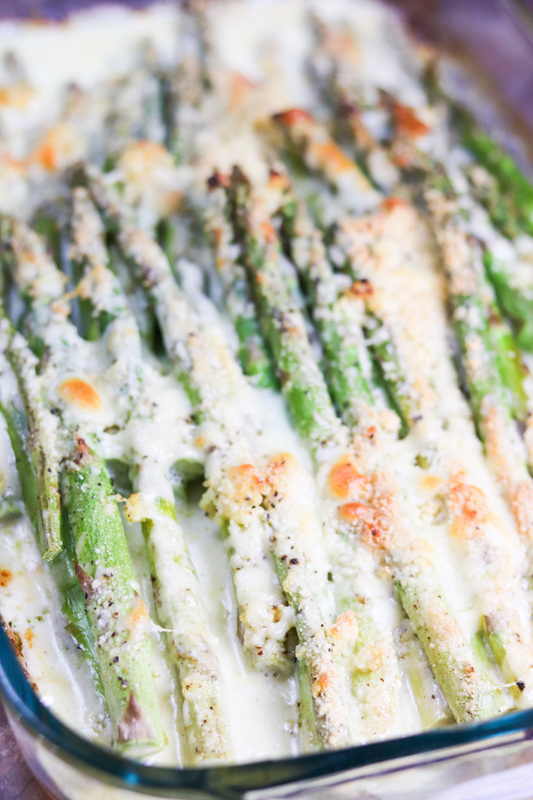 Creamy cheesy baked to perfection, this Creamy Baked Cheesy Asparagus is the perfect side dish. This Creamy Baked Cheesy Asparagus is sponsored in conjunction with #BrunchWeek. I received product samples from sponsor companies to aid in the creation of the #Brunchweek recipes. All opinions are mine alone. Delicious fresh asparagus in a creamy sauce and smothered with shredded cheese. 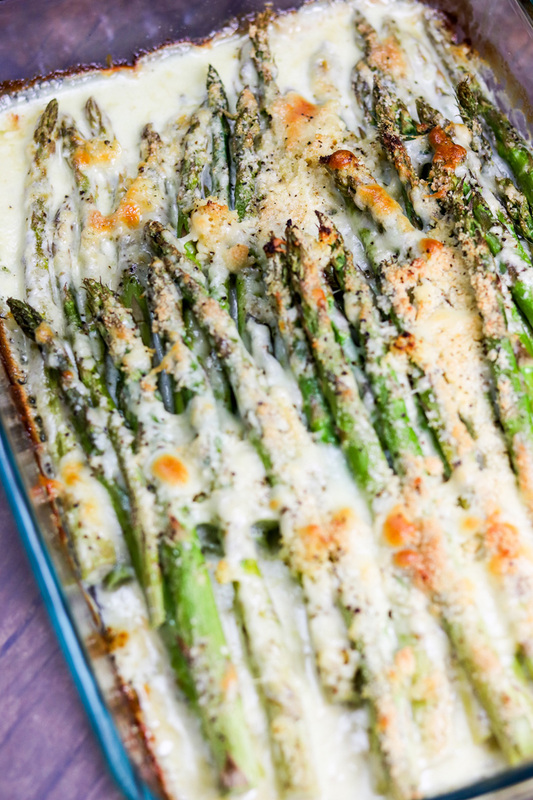 This Creamy Baked Cheesy Asparagus should grace every brunch table! As far as brunch recipes go – this ones the best! A huge shout out to Michigan Asparagus and Cabot Cheese for making today’s recipe possible. It’s the second day of #BrunchWeek and today I’m bringing you this Creamy Baked Cheesy Asparagus. This is one of those dishes that goes great with practically any meal. We enjoy it often just because, but it’s also just elegant and flavorful enough to wow your guests at a brunch or dinner party. It’s also super simple to throw together which makes it a staple side dish for us. Did you miss any of my Brunch recipes? 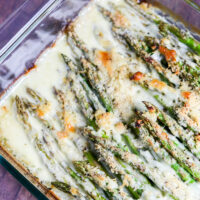 How do you make Creamy Baked Cheesy Asparagus? Delicious fresh asparagus in a creamy sauce and smothered with shredded cheese. 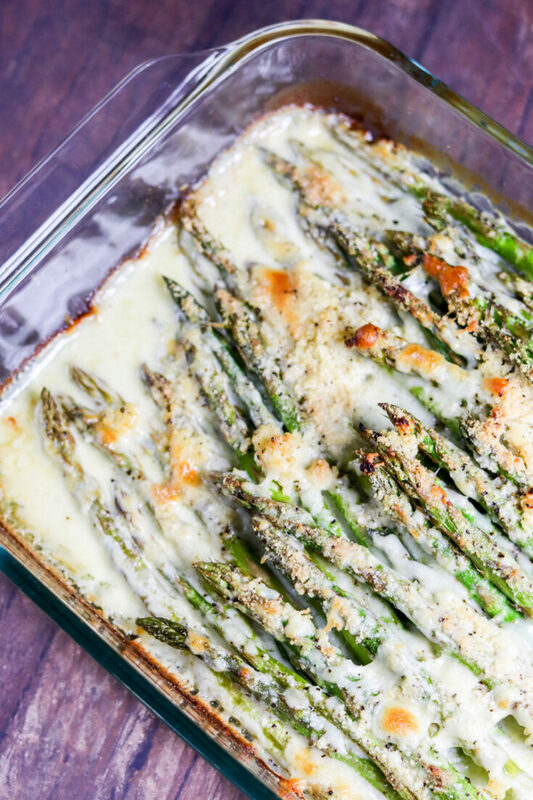 This Creamy Baked Cheesy Asparagus should grace every brunch table! As far as brunch recipes go - this ones the best! Place prepared asparagus into your baking dish. Pour the heavy cream over the top. Sprinkle the minced garlic over the top. Sprinkle Parmesan and shredded Cabot Farmhouse Cheddar Cheese all over the top. Bake at 400 degrees F for 25-30 minutes or until asparagus is tender and cheese is golden. I love all that cheese! With only 10 mins prep time, I really need this for dinner tonight. 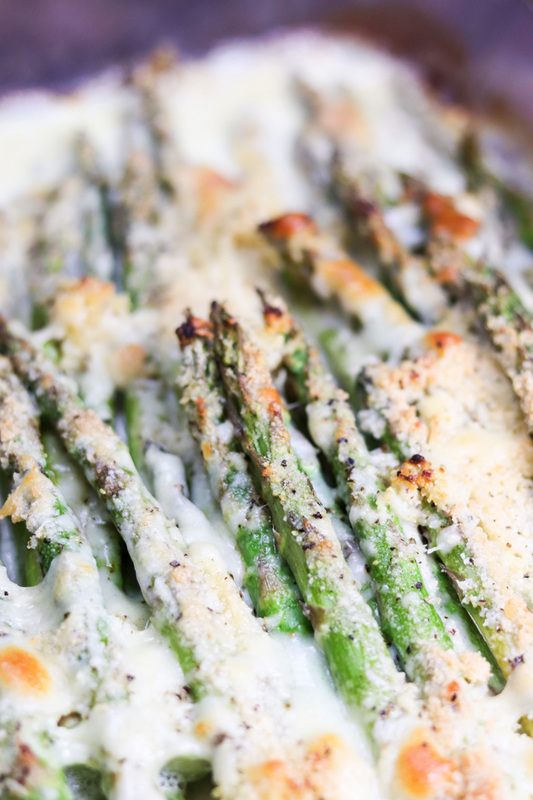 And who can say no to this creamy cheesy baked asparagus? Yum! These sound so comforting! Cheese and asparagus go so well together. YUM two of my favorite things in one dish.